When you enter the homepage at WritingService.EssayHave.com, you’ll find tons of text you don’t want to read when you’re in a hurry. That’s not a serious disadvantage, though, since the company still explains everything you need to know about its services. You will find out about the offer, prices, ordering process, writers, and more. The quality this team delivers is nothing impressive, but it can still get you an average grade at college. Still, you need to be aware of the fact that the company doesn’t always deliver the papers on time. For a website with so much text, it’s strange to see that there is no separate page for the list of services it offers. The dropdown menu in the Our Services section is not complete; it lists the following products: essay, research papers, courseworks, thesis, write my paper, write my research paper, and write my essay. The last few “services” don’t make sense. Unfortunately, you can’t get editing, proofreading, and formatting services at WritingService.EssayHave.com. This means that the company has hired writers from different categories of study, but there are no professional editors in the team. That can be a problem when you want to order a serious project. The prices at this website are really affordable. Most orders are available with deadlines ranging from 1 month to 8 hours. However, the longest deadline of 1 month is not available for simple projects of High School and Undergraduate (years 1-2) level, so you can order the content with deadlines from 14 days to 8 hours. The orders of Doctoral level are not available with the shortest deadline, but you can get them under the 24-hour deadline. There are 5 quality levels: High School, Undergraduate (years 1-2), Undergraduate (years 3-4), Master’s, and Doctoral. Depending on the quality and deadline, the price for an essay will range from $10 to $48 per page. Unfortunately, there are no discount codes at WritingService.EssayHave.com. The company has developed a program for life-time discounts, which are based on ridiculous amounts of money. Thus, you would have to spend over $500 to get the lowest discount of 5%, and the highest life-time discount of 15% will become active when you spend over $2000 at the website. You won’t find any additional features in the order form. Most other companies allow you to request a top writer, VIP service, plagiarism report, and other extra services. 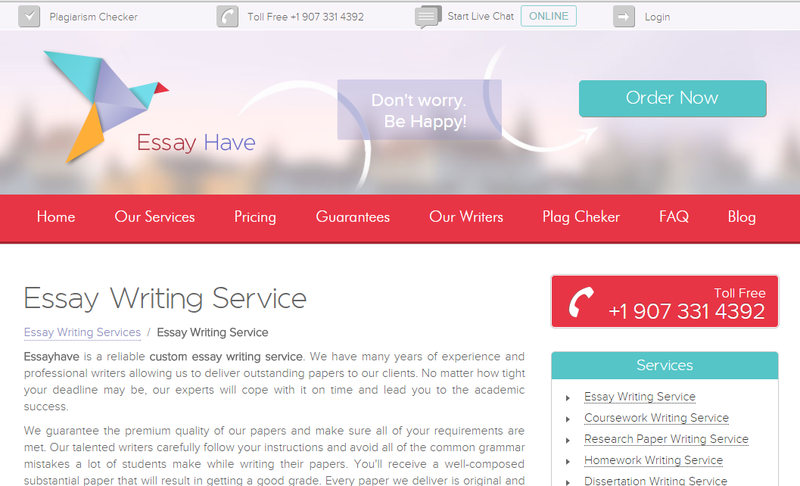 With WritingService.EssayHave.com, you only get the standard offer with no opportunities for a better service. The customer support system at this website is pretty decent. Although the live chat is only available from Monday 00:00 AM to Saturday 01:00 PM, it’s still helpful. The agents are friendly and they do their best to help. They are also available via phone and email.